Long used in Victorian England as a conservatory plant, 'Chinese Lantern' showcases both foliage & blooms. 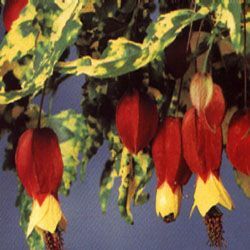 The blossoms look like small red lanterns with flared yellow tips spilling down from the pointed variegated golden and green leaves. Use in urns, baskets and mixed containers.